I really can’t believe I’m in my 9th week of my internship-it’s all gone by so fast! 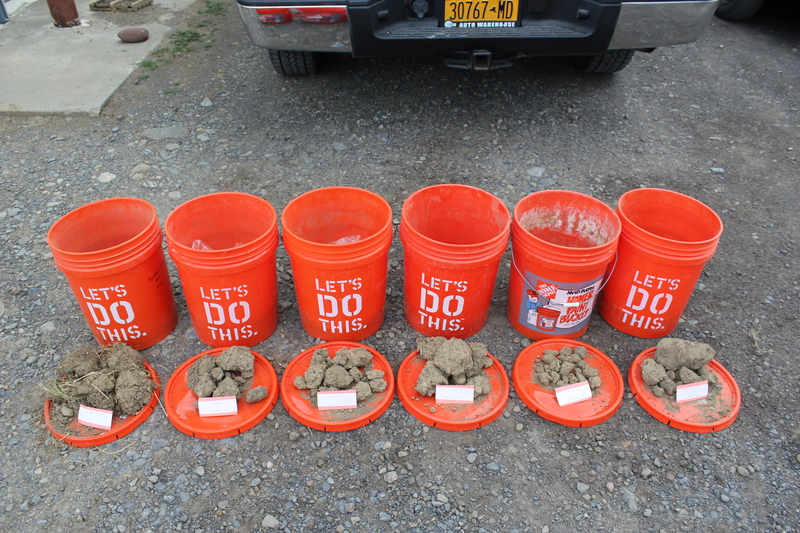 The past two weeks I’ve spent a great deal of time preparing extension materials. 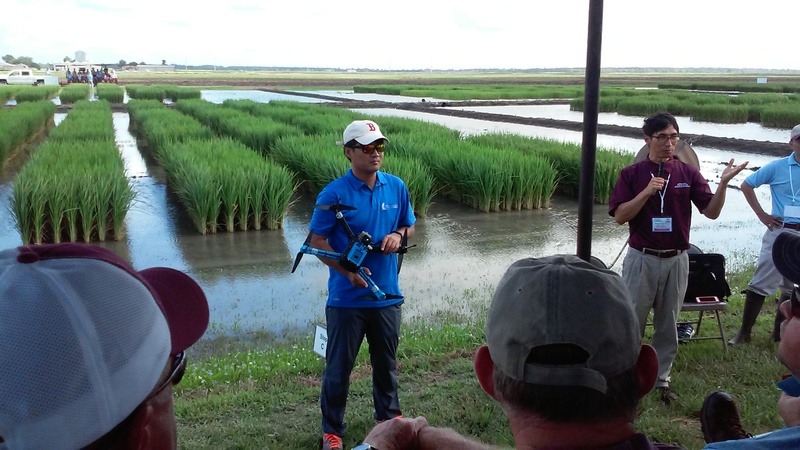 Although it was great to present our studies to the local farming community at the field day two weeks ago, field days are certainly not the only way to connect with farmers to share our findings! 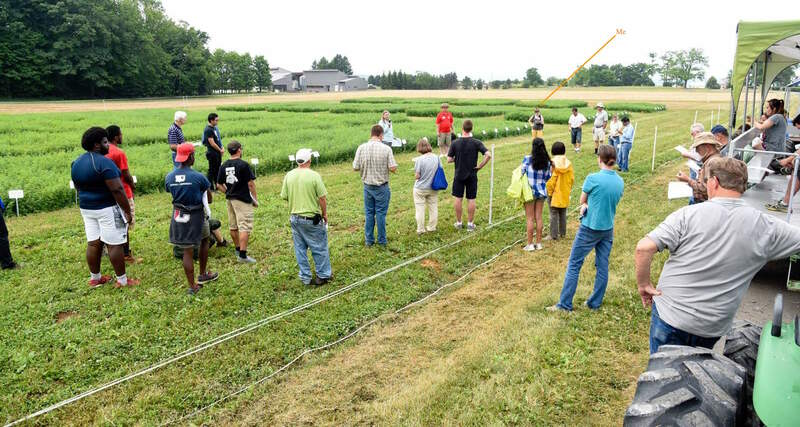 The NMSP publishes scientific papers to journals often, but we also try to accompany these papers with extension documents of various sorts to be able to share with farmers from all over NY state. The first extension material I’ve been working on is an agronomy fact sheet. The topic I’ve been writing about is aggregate stability with manure management. 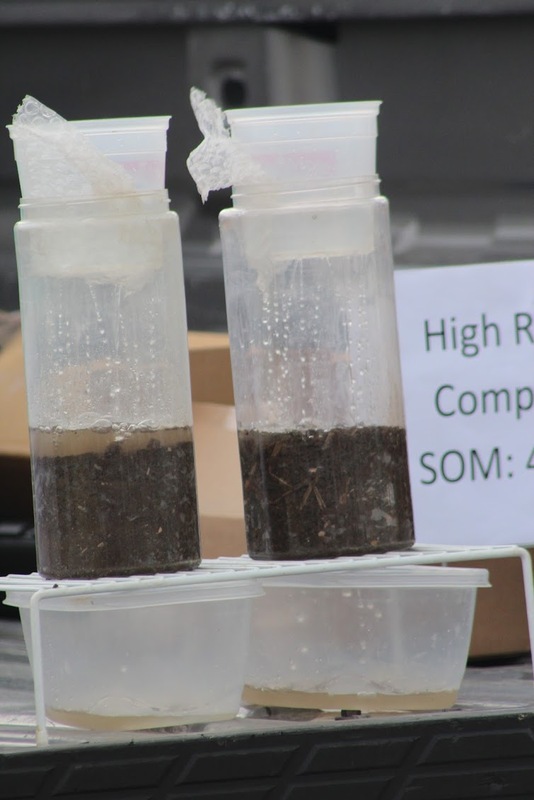 Aggregate stability is such an important component of soil health because it dictates and is impacted by several other soil properties such as: pore space, infiltration, organic matter, etc. Although many inherent properties of the soil will affect aggregate stability, we can manage fields in a way that favors the building of aggregate stability. For example, we have found that by adding organic sources of nutrients, such as liquid manure or composted manure, to a corn/alfalfa rotation, we can improve aggregate stability and the overall health of the soil. The second extension material I’ve been focusing on is a What’s Cropping Up? 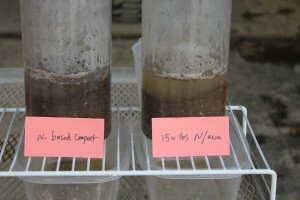 article summarizing our paper on soil properties. What’s Cropping Up? 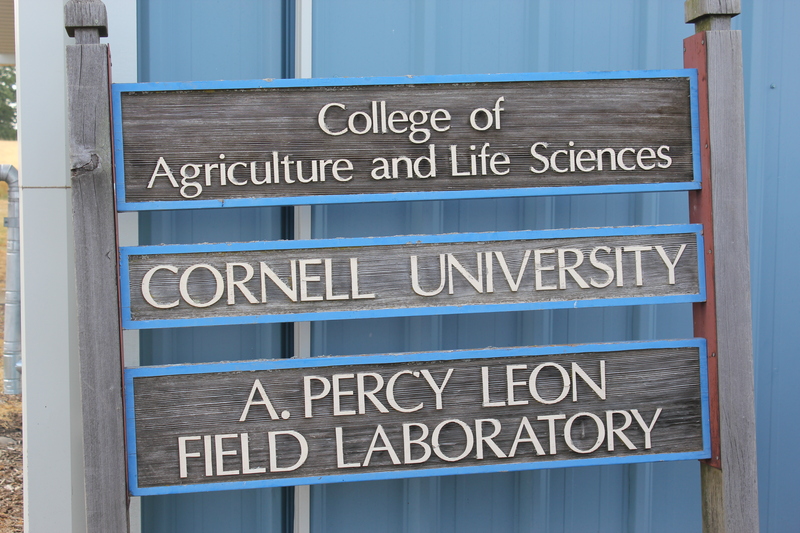 is a bi-monthly digital newspaper distributed by Cornell’s Soil and Crop Sciences department targeting farmers and farm advisors. The goal is to give an easy to understand, concise summary of published journal articles. 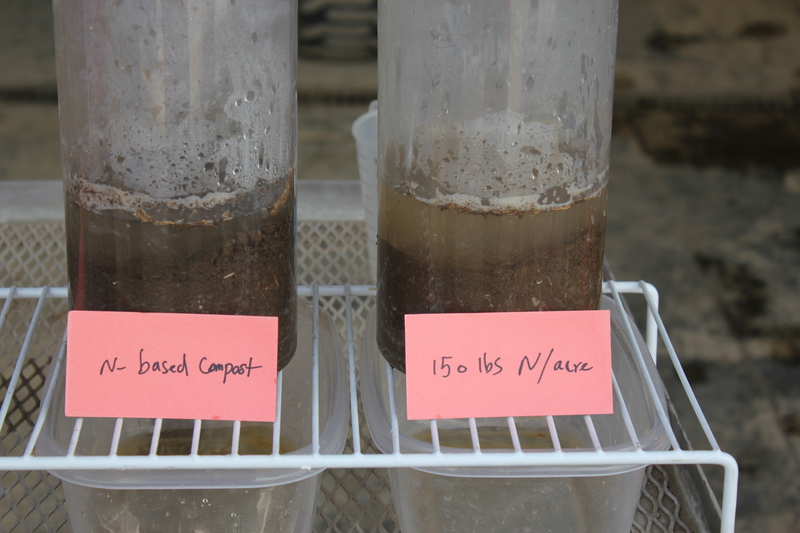 We are working on finish an article about soil health changes when shifting form N-based to P-based manure and compost application rates. In the coming week we hope to put together a video clip demonstrating infiltration differences between a soil treated with inorganic nutrients and soil treated with organic sources of manure. In practice, we have seen stark differences and really want to show people how much of a difference 15 years of applying organic sources of nutrients can make on a field. Hopefully these materials will be useful to farmers across NY in making the best management decisions for their fields! The last couple of weeks I’ve been traveling across New York State looking at test plots and fields along with way. From Buffalo to Watertown and Utica as well there’s plenty corn and soybean fields to be seen. As I looked at each plot the main factor effecting the health is the amount of rain. 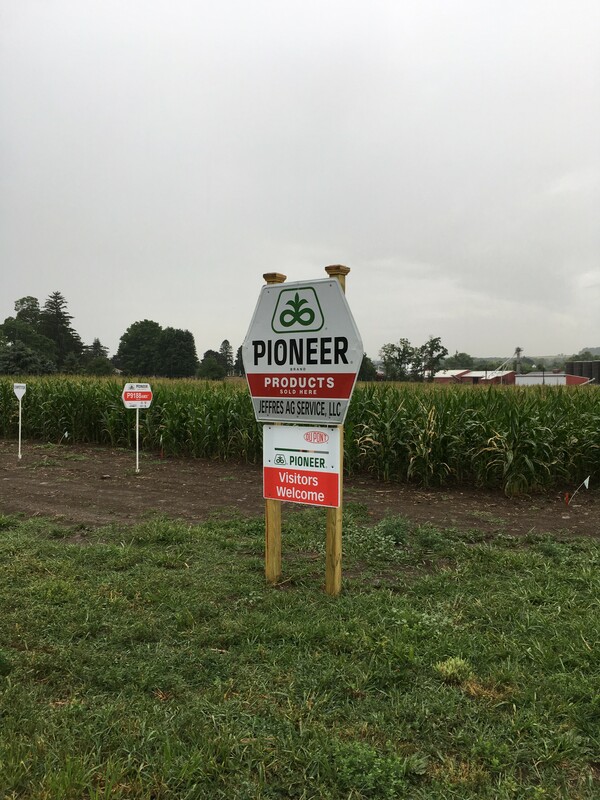 Each plot I looked at I’ve been putting up signs and reporting on the best varieties of corn. 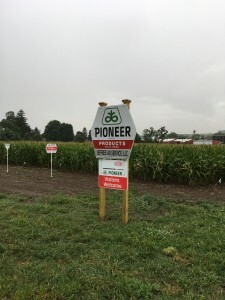 Even though each field varies in the amount of rain, height, and fertilizer or spray applied; there are several varieties that stood out overall. I complied all of my results into a slide show that showed the best corn varieties; Seedway and others included; and gave a short presentation at their annual sales meeting this past Tuesday. 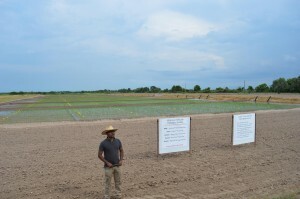 As all the district sales managers listened and discussed at the end, the varieties were not very surprising as most of them were drought tolerant types. In the up coming weeks, we have grower appreciation days and field days for farmers in the area to view the corn crops side by side before they order next years crop. The soybeans are the next project to come in the following weeks as they are not as matured and ready for presentation yet. A big part of what our NMSP team does is extension work. We conduct a lot studies, but none of it will ever be significant if we cannot effectively communicate the things we learn with farmers to improve NY s agriculture. Most of our research plots are located in Aurora, NY at Musgrave Research Farm. 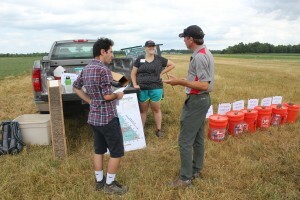 To better present our findings to farmers and farm advisors, the farm hosts an annual field day where various groups may create short 20-25 minute presentations. 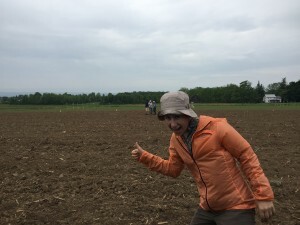 Because I am working on the Dairy Cap project (currently in its 16th year here at Cornell) our presentation was titled “Tracking Soil Changes from Long-Term Manure Applications”. We talked to the farmers, farm advisors, and other extension agents who attended primarily about changes over time in corn and hay yields as well as soil organic matter trends. I worked with Amir Sadeghpour, the post-doc whom I’ve been working with on the Dairy Cap project, as well as Karl Czymmek, PRO-DAIRY senior extension associate. Amir and Karl have much more experience with the project and so they took the lead on discussing the data and long term trends, while I focused on a visual to show the audience that the changes go beyond numbers on paper. We also teamed up with Amy Langner, a NRCS agent, who was able to show us how to demonstrate a rain infiltration test. Amy was super helpful, extremely enthusiastic, and encouraged me every step of the way! I presented the crowd with a display of soil clods from soils treated with inorganic and organic fertility amendments (0 inputs, inorganic 150 lb/ acre N, high rate of compost, high rate of manure, low rate of manure, and continuous grass) as well as with the infiltration test demonstrating the lack of aggregate stability in the 150 lb/ acre soil leading to surface crusting as compared to the soil that received high rates of compost which, generally, has shown us better infiltration with its increased aggregate stability. Luckily, the infiltration demo worked spectacularly for the first crowd! The differences were very apparent and it really sparked the audience’s attention. The second demo did not show clear differences between the two, which was disappointing, but it definitely helped us to practice thinking on the spot as we continued to defend our findings, even when the demo wasn’t cooperating. Overall, we had a really fun day connecting with new people and spending time together outside of the office. It was a really great opportunity to practice my extension skills and share our enthusiasm about soil with the audience! Forage sorghum is not always harvested for the highest yield, sometimes the quality of the sorghum is also an important factor that farmers will consider when making the decision of harvest. Time of harvest can decide trade-offs between yield and quality, so I paid attention to this topic in my summer internship. 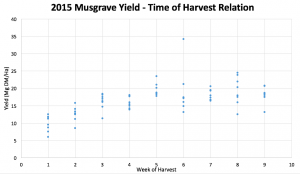 Generally, the sorghum yield tends to increase as the harvest time is delayed. This increase might be attributed to the longer time of dry matter accumulation in sorghum tissues. 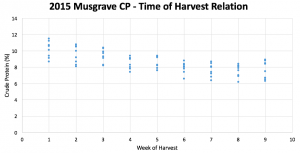 However, the yield will finally reach a plateau where the later harvest does not result in a significant increase in yield due to the maturity of the plant. On the other hand, the change of sorghum quality may have different trends. The crude protein content tends to decrease as the sorghum reach maturity, while the lignin content tends to increase as the harvest is delayed. The crude protein is important to the nutritious value of the feed, high crude protein content in sorghum feed may relatively reduce the need of other protein supplement. The lignin content partly determines the digestibility of the forage, too much lignin will reduce the digestibility and thus lower the quality of feed. To balance the yield and quality, farmers need to decide the time of harvest to gain the most suitable forage according to their own needs. For example, when there are other available sources of crude protein, the crude protein in sorghum forage might not be that important. Then farmers may choose to pursue higher yields by waiting longer. Yet if farmers do treasure the crude protein in sorghum and want higher digestibility, then they may sacrifice certain amount of yield in exchange for better quality. Anyway, farmers will make decisions according to their own situations. 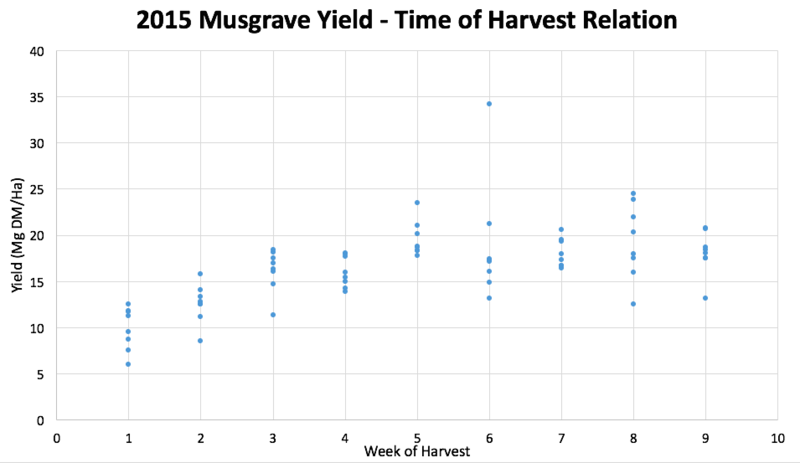 What I can do in my summer intern is to figure out trends of yield and quality change as the harvest time changes. By offering some information that can help to the process of decision-making, I can also slightly contribute to the actual production. 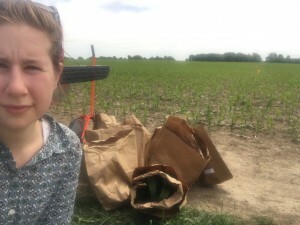 This summer the Tompkins county suffered drought, for almost a month there was no decent rainfall and the water was really deficient for vigorous crop growth. 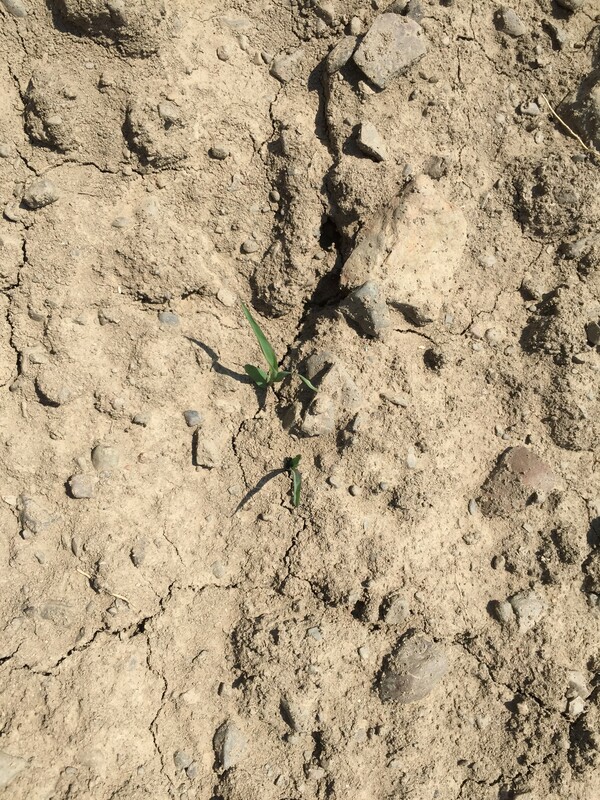 One of our sorghum fields was located in Varna, and it took nearly the whole June for those sorghum seeds to emerge from the soil. The sorghum was usually viewed as a drought-tolerant crop that did not need much water for survival, yet extremely drought after planting would still delay the emergence since seeds could not well germinate without certain amount of moisture. 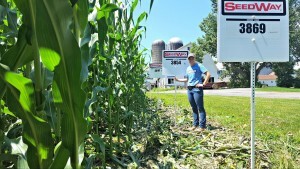 The corn at the Musgrave experimental farm also showed obvious symptom of water deficiency. 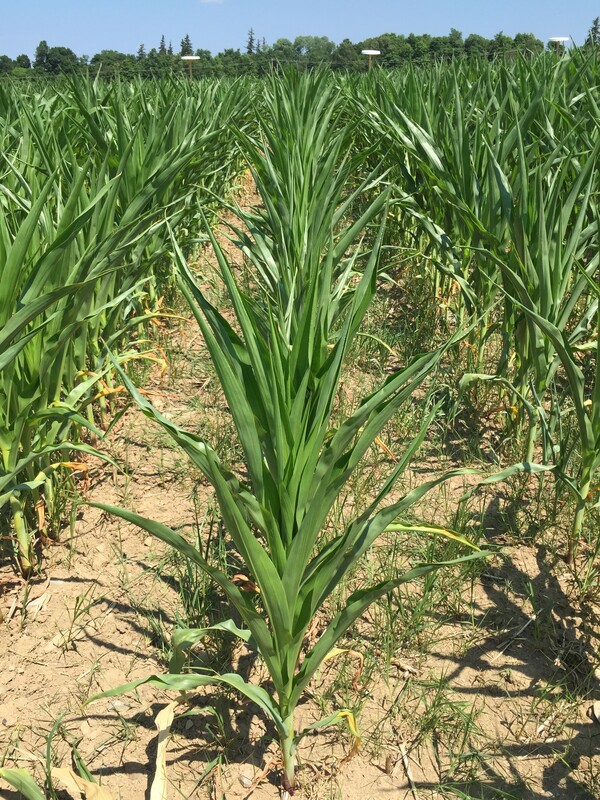 By the early July, the corn had reached the V8 to V9 stage and the average height was around. Due to the drought, newly-developed leaves rowed and older leaves turned yellowish. Rolling leaves could reduce transpiration of water from the leaf surface, yet it also reduced the solar radiation intercepted by the canopy for photosynthesis. Less photosynthesis would result in insufficient accumulation of biomass. 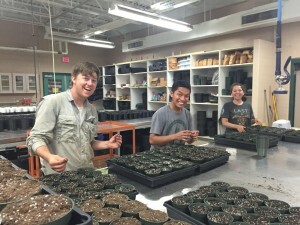 Besides, limited moisture in soil would restrict the roots’ absorption of nutrients. Hence the corn yield might be lower than normal years. 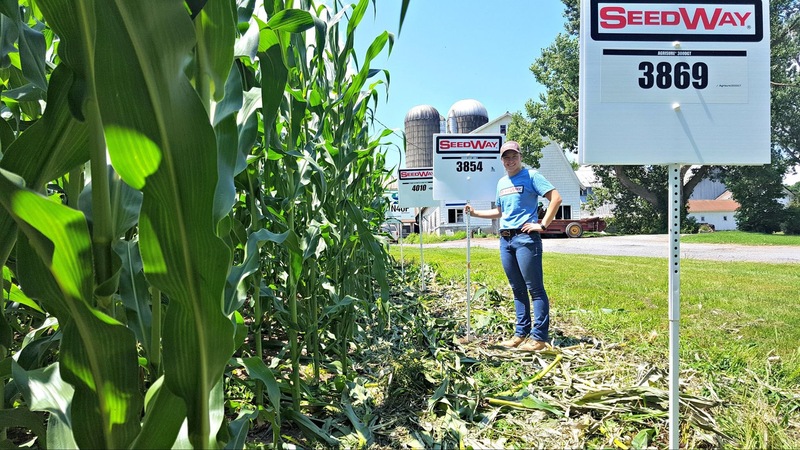 Since the water is usually abundant in New York state during the growing season, not much attention would be paid to irrigation issues, especially in corn and hey production. To increase the crop’s resistance to drought, adjusting planting date and improving soil health are two important methods. 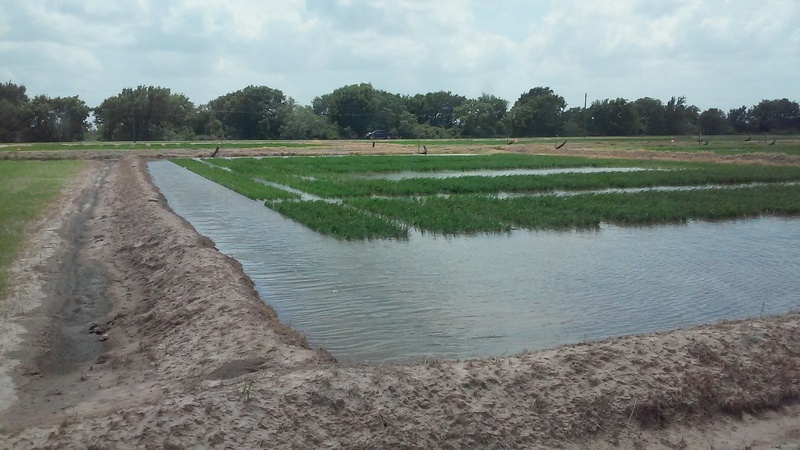 By adapting reduced-tillage, leaving more residues on the soil surface or planting cover crops, the soil’s water holding capacity can be increased and thus benefits crops during drought. I hope there would be more rainfall in the following days. 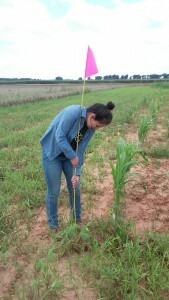 Hang in there, my sorghum seedlings ! 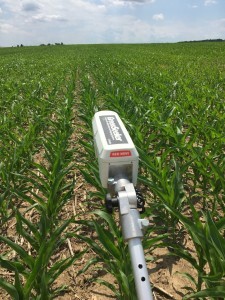 Crop canopy sensing technology has been increasingly used in precision agriculture. 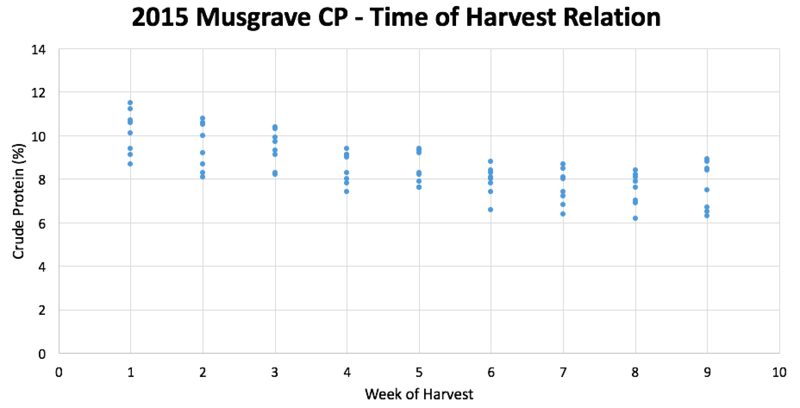 Imagine that if farmers are able to know the crop’s growth status just by scanning leaves, then the field management will be much more convenient and accurate. Since I am interested in precision agriculture technology, the canopy sensing is really attractive to me. And in my summer internship, I get the chance to experience this fascinating technology. The canopy sensing technology I use is called GreenSeeker®. It is an active sensing device which contains a light emitter and a receiver. The emitter emits certain wavelengths of light towards the crop canopy, and the receiver measures the light that is reflected by leaves. 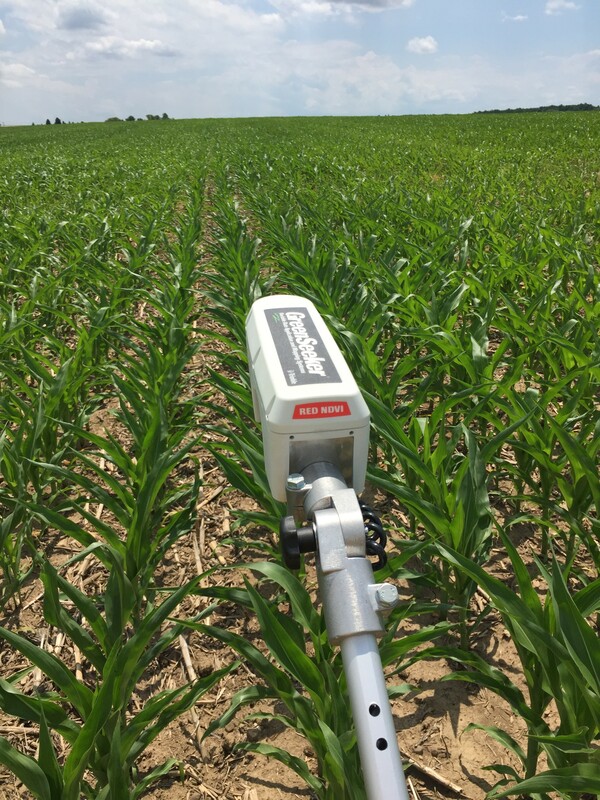 By comparing the intensity of different wavelengths in reflection, the GreenSeeker can calculate the extent of canopy absorbance of light, which can be use as an indicator of crop growth status. In my case, the normalized difference vegetation index (NDVI) is calculated by the relative absorbance of near-infrared and visible light. High NDVI value (close to 1) indicates vigorous growth, while low NDVI value (close to 0) suggests that the crop is in stress. To gather the NDVI data at different crop growth stage, field scanning was conducted for many times during my intern. 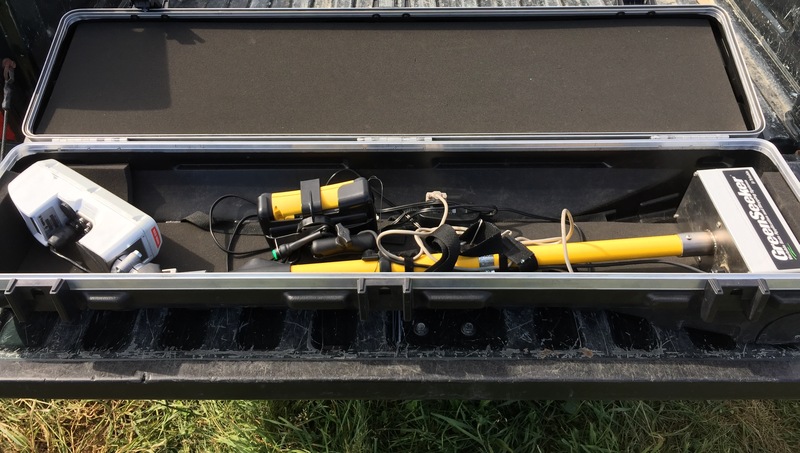 I carried the GreenSeeker and held the sensor above the canopy, walked through the field with my finger pressed on the trigger that controlled the emission of light. The track of my walk was captured by the GPS and was shown on the PDA attached to the GreenSeeker, so I also needed to notice the screen to make sure that I walked in relatively straight line. The sensor emitted one pulse of light per second, so the final results were lines of data points across the field. Each data point carried lots of information include speed, direction, GPS location, calculated NDVI value, etc. 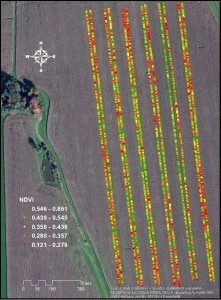 With the GIS software (ArcGIS), we got a scanning map that showed the distribution of NDVI values in the scanned area. 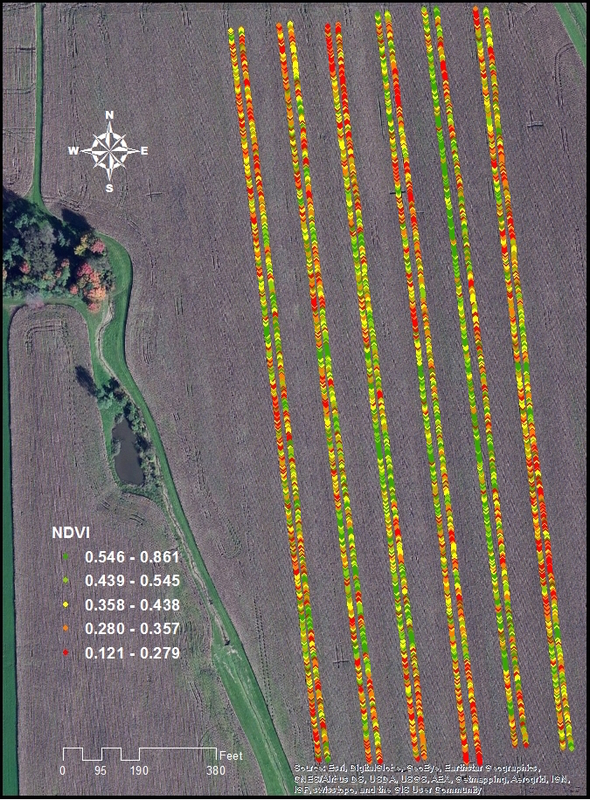 The difference in NDVI value indicated the uneven growth status of crops in the field. 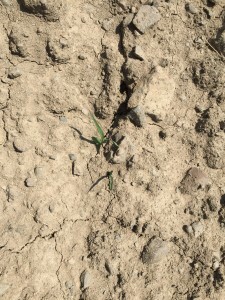 Such uneven pattern could be explained by the spatial variability of nutrients content in soil, for example, the nitrogen was abundant in some area but deficient in other parts of the field. Then according to different levels of need for nutrients, farmers can adopt variable rate application of fertilizer to maximize the nutrient use efficiency. In this way, farmers could save fertilizer from plants that already had enough nutrients supply from the soil, and thus reduce nutrient losses caused by excessive application. 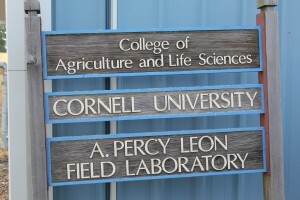 The Certified Crop Advisor (CCA) program was established in 1992 by the Society of Agronomy. Besides having, or being interested in a consulting career, many people take the exam for a variety of reasons; prerequisite for some industry positions, or PhD programs, supplement to college degree…etc. The exam itself covers four different areas: Crop, Soil and Water, Nutrient, and Pest Management and test takers are expected to know local management strategies adapted for their local climate and also broader management strategies. To achieve this, the test is split into local and international sections. The local section of the exam is organized by region. There are 28 regions in the U.S. Each region has its own committee board which has a variety of responsibilities including writing their local exam. New York State is part of the ‘Northeast Region’ which also includes CT, ME, MA, VT, NH, and RI. 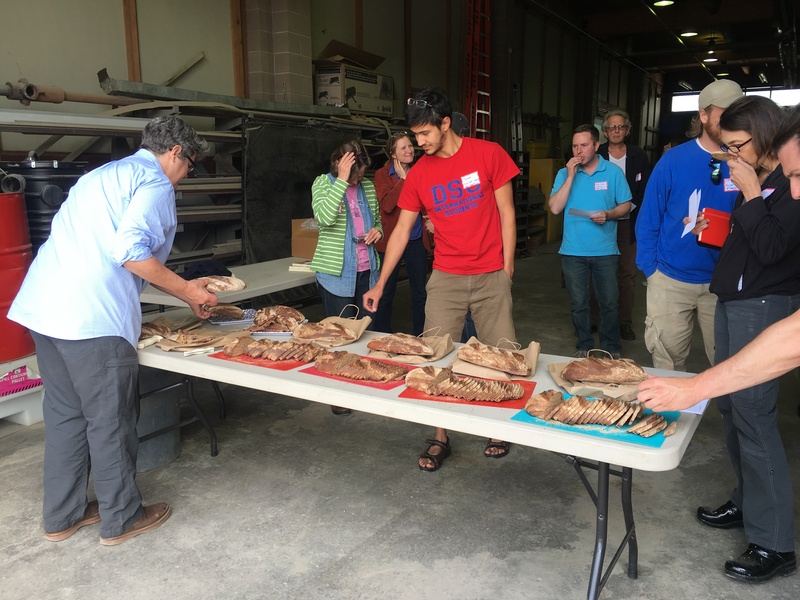 The international section is organized by the international committee board, located in Wisconsin which is also the CCA program headquarters. In addition to writing their respective exams, the boards are also responsible for providing test takers with a set of study guidelines which come in the form of statements such as “Know the 17 elements essential for plant nutrition” or “Understand the process of soil formation”. The CCA program calls these study guidelines ‘performance objectives’ or PO for short. Though it was not required by headquarters, the Northeast Region wrote a study manual to accompany their local POs and developed a study website with practice questions for each PO. Quirine is on the committee board for the Northeast Region and is responsible for the educational materials (POs, study manual, and practice questions). I am working with her to update these materials. The POs are required by headquarters to be updated every few years but the manual and practice questions have not been updated or revised in some time. The PO’s were originally compiled by a number of people. 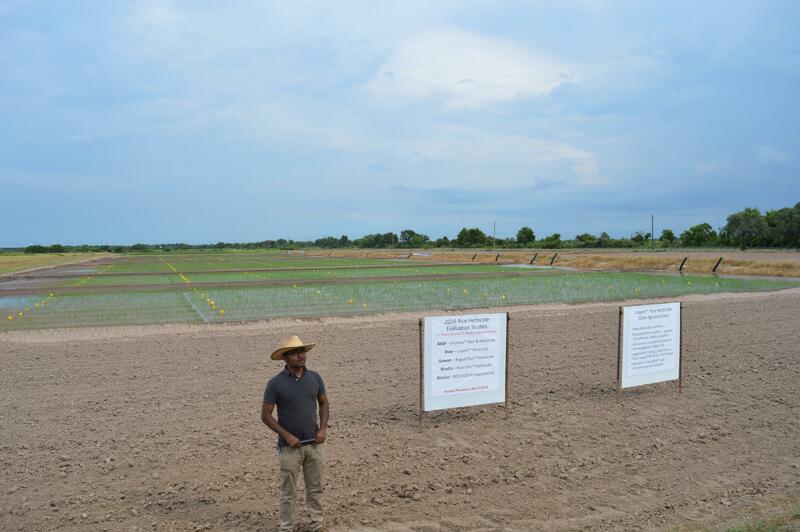 Each area; pest management, crop management, soil and water management, and fertility management, requires niche knowledge and so the POs were compiled by a number of professionals in the respective fields. For example, the pest management POs were put together by a weeds professional, insect professional, disease professional, pesticide/herbicide professional…etc. I connected with many of the original folks who were involved with making the POs and some new ones and asked them to review their sections and make any necessary updates. This process took many weeks and a lot of emails. After being updated, the POs will be sent to Wisconsin for approval from HQ. This was the first task and I have been working on it since my first day. At this point, five weeks in, it is 98% complete. With any change in the PO document, the content written for the study manual also changes. The same folks who made updates to the POs, I also asked to draft or edit content in the study manual. As well as getting the manual synch with the POs, I have also been working on revising some sections to read more smoothly. I have been doing this alongside getting the POs updated and am probably 35% of the way to finishing. Out of all three areas of this project, I have done the least here. There is already a large bank of practice questions that exists but many of these questions do not follow Wisconsin’s question format. In addition to formatting, each question must be linked to a particular PO. I have been working on moving the question bank from Word to Excel so that they may be sorted by management area (pest, soil and water, fertility, and crop) and also by PO. I still have to revise the format of questions out of compliance with regulation and create questions for the POs which have none, as well as write more questions for the question bank. Improving the online study materials and practice questions is the main reason why the NRCCA created this internship and so for the rest of the summer I will focus the most time on this. If anyone is interested to hear more about the certification or has any questions in general feel free to shoot me an email! I have just celebrated my five-week anniversary of working with Quirine Kettering and her team. This blog post will be my attempt to catch up on some thoughts so far. 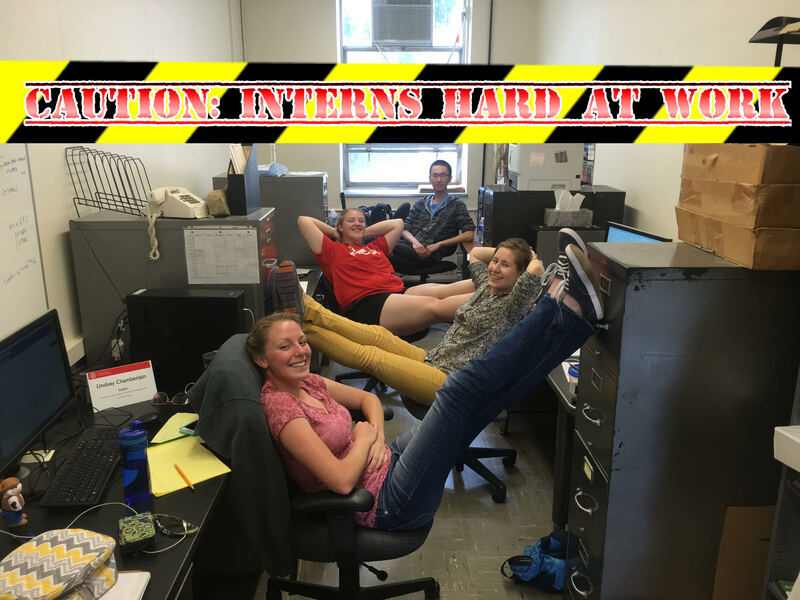 There are a couple post docs, some grad students, four of us interns working on projects under Quirine as well as a few other faculty members who have their own projects and work. 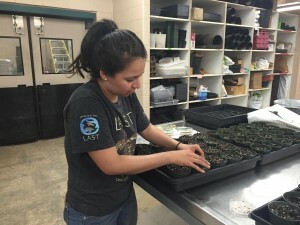 The three other interns are teamed up with a graduate student or post doc working on research, while I am working directly with Quirine on updating and revising study materials for the Northeast Region Certified Crop Advisor (NRCCA) test. Though everyone has their own projects, and we work from different offices on the third floor of Morrison, the atmosphere is very open, helpful, chatty and welcoming. I wander into the other offices multiple times a day with questions or just to see what others are up to. Everyone takes lunch together which really helps build a feeling of comradery. We talk about current issues in agriculture, discuss people’s projects, catch up on the presidential race, and sometimes just chat about where we’re from. (Between everyone, the countries that are represented are The Netherlands, Greece, Iran, Nepal, China, Poland, Canada, and the U.S.) Working in this type of positive environment as been incredible. I think this is a truly unique team structure which Quirine has established; the other interns and I often remark that most of our past experiences in other labs or projects have had less community between members. The project I am working on with Qurine, updating and revising study materials for the NRCCA, has a lot to it, which I will write all about [in excruciating detail] for the next blog. As for what I do all day, that’s an easier question- I sit behind a computer. (Actually, two.) Where the magic happens. This project has me behind a computer all day but thankfully there have been some opportunities for me to get my hands a little dirty. 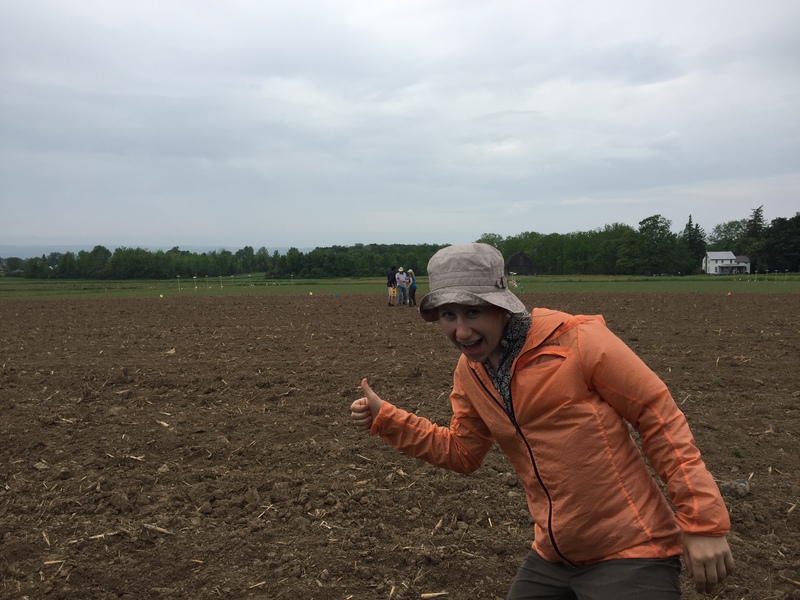 I have participated in three field days so far: small grains management field day at Musgrave research farm, organic grains field day at Love Lab, and seed growers field day at the NYSIP Foundation Seed Barn. I have also lent a hand to some of the other projects Quirine’s team is involved with; helping with measuring and flagging a field in prep for planting, taking corn clippings for biomass analysis, scouting a stressed field for clues about the origin of stress, and transporting ground and sieved soil samples to the lab for aggregate stability analysis. Besides field days and field work I have also gotten out of the office to meet with some of the different folks who are also involved with the NRCCA study materials. I enjoyed going to different buildings on campus and chatting with people from a range of disciplines.